can't believe we're on to the last polish of the China Glaze Cheers! collection... and it's Break The Ice! (it's a press sample, kindly provided to me for review). 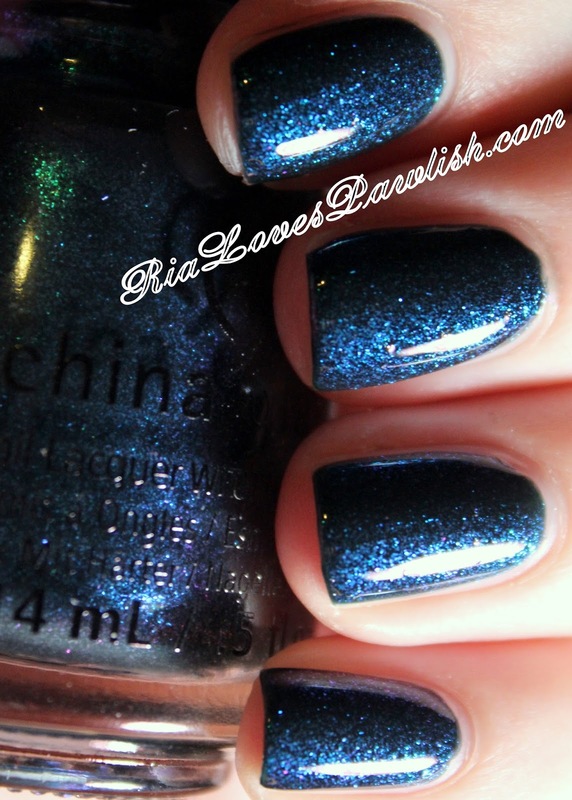 Break The Ice is perfectly named as it's a holographic shard flakie glitter... *faints*. if you've been with me for awhile, you know that i LIVE for flakies! this one is just stunning. you'd be hard pressed to get it opaque on its own, but it's a perfect topper. i used one coat with some placing... never used a flakie that didn't require some placing... but they're worth the trouble! i used it over China Glaze Better Not Pout (press sample)... love how the fuschia brings out all the colors in Break The Ice. definitely use topcoat to seal in the flakes and make sure there are no pokey pieces sticking out. one coat Break The Ice over Better Not Pout, finished off with one coat Salon Perfect Crystal Clear Top Coat. wrapping up the holiday season while wrapping up the holiday collection... sure seems appropriate! so thankful for the opportunity to review this collection. i'm so happy to be back to riding again! hate having to take time off, but my muscle tear was demanding it. it's not 100% for sure, but it's loads better :) the weather was pretty crummy for most of the time i was out of commission, which always makes me feel a *little* better about missing time. today's China Glaze Cheers! polish is perfect for New Year's parties! it's called Bring On The Bubbly, which right there puts you in the party kind of mood :) (it's a press sample, kindly provided to me for review). it's a glitter with multiple sized golden hex pieces with small holographic pieces, all suspended in a clear base. you may be able to get this opaque on its own, but i feel it works better as a single coat topper with minimal placing needed! i used it over China Glaze Wine Down For What? (press sample) and the combo looks beautiful together. it needs topcoat to seal in the pieces and give a big shine! one coat Bring On The Bubbly over Wine Down For What?, finished off with one coat Salon Perfect Crystal Clear Top Coat. Labels: Bring On The Bubbly, Cheers!, China Glaze, glitter, Gold, Nail Enamel, Nail Lacquer, nail polish, nail varnish, Press Sample, Salon Perfect, Wine Down For What? i can't get over the fact that it's the last weekend before Christmas! are you guys ready? as usual, i'm not nearly. procrastinators unite!... later. ;) Brother Pawlish is coming for a visit starting Monday, we're scooping him up on the way to visit my Nonna, then bringing him back with us! super excited! today's China Glaze Cheers! polish is Brand Sparkin' New Year! (it's a press sample, kindly provided to me for review). it's a glitter made up of different sized purple and holo hex pieces suspended in a sheer purple base. in three coats you get that awesome look where the pieces are super dimenional in the clear base! you can also just use it as a topper, or as an ultra sheer tint on your bare nails. you must seal this bad boy in with topcoat to keep it all together and bring on a gorgeous gloss! three coats Brand Sparkin' New Year, one coat Salon Perfect Crystal Clear Top Coat. lookie what's going on over at Ulta today! 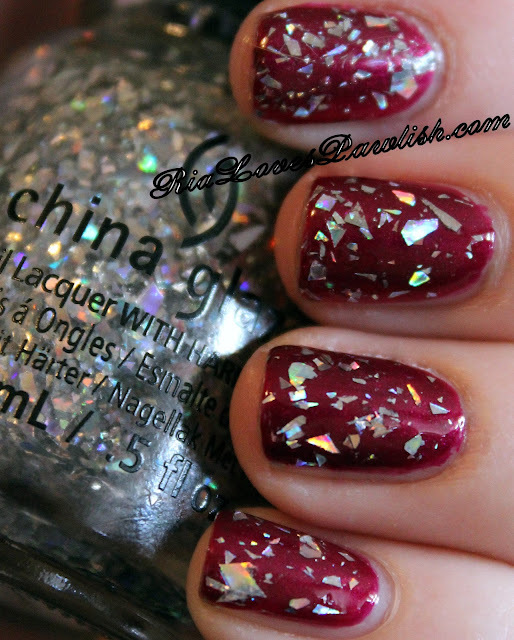 you can search China Glaze Cheers! in the upper left corner of this page to see all the reviews i have up thus far along with swatches. THIS is the direct link to the press release which shows all the kits and a glance at the polishes from the collection. but Ulta may or may not have all of the kits (as the photo only shows the Mini Mixers), so it's best to scurry on over, i think! PLUS at 50%, i'm thinking they will definitely be selling the individual polishes like hotcakes... although you can grab those babies online. Ugly Sweater Party is today's China Glaze Cheers! polish! (it's a press sample, kindly provided to me for review). it's made up of hex glitters with larger blue pieces, and smaller silver and holo pieces. the silver glitters look red and pink because everything is set into a sheer red base. i love the look of these with three coats, you can see all the layers of glitters... it's pretty fabulous! it also can be used as a topper for other polishes, love ones with multi-uses like that. 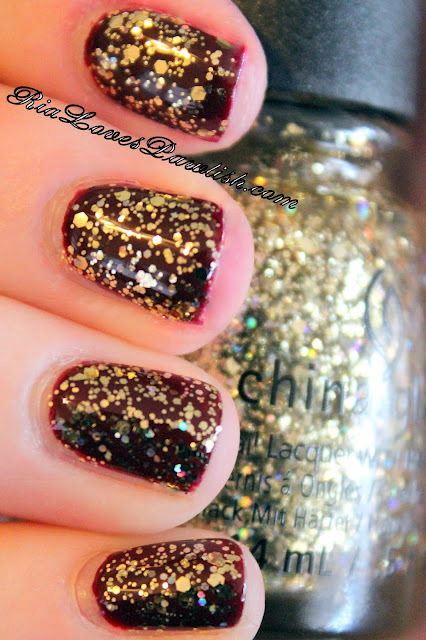 definitely seal this mani in with topcoat... and it will bring out all those shinies! three coats Ugly Sweater Party, one coat Salon Perfect Crystal Clear Top Coat. the first picture is more how it looks all the time and you can see a bit of the holo... the second picture really shows all the dimension you get with three coats! not sure why the holo doesn't show up at all in that one... polish is so tricksie sometimes. today's China Glaze Cheers! polish is I Soiree I Didn't Do It! (it's a press sample, kindly provided to me for review). it's a glitter made up of tiny pieces of teal, purple, and holographic bits... slightly different sizes, but all quite small! i *think* it's set in a sheer teal base, but it could just be a lot of microglitter. this one is pretty opaque in three coats (it would take close examination to notice lacking spots), but could also be used as topper! as with all glitters, definitely add topcoat to seal it in and bring out the sparklies. three coats I Soiree I Didn't Do It, one coat Salon Perfect Crystal Clear Top Coat. today's China Glaze Cheers! polish is Don't Get Elfed Up. (it's a press sample, kindly provided to me for review). this is definitely my favorite polish from the Cheers! collection! it's a dark, multichrome shimmer that flashes teal, blue, and purple. it's. AWESOME. probably the best i've ever seen in this vein of polishes! so easy to work with and looks perfect at two coats... completely opaque, no need to layer over a base color. it's a bit dull on dry down... but a glossy topcoat brings out all the yumminess this bad boy has to offer! these photos show the different colors you get from this polish. teal is the dominant color... and surprisingly, purple is the most shy of the colors. by the bottle, i would have thought it would be stronger than the blue! two coats Don't Get Elfed Up, one coat Salon Perfect Crystal Clear Top Coat. today's China Glaze Cheers! polish is Peppermint To Be. (it's a press sample, kindly provided to me for review). 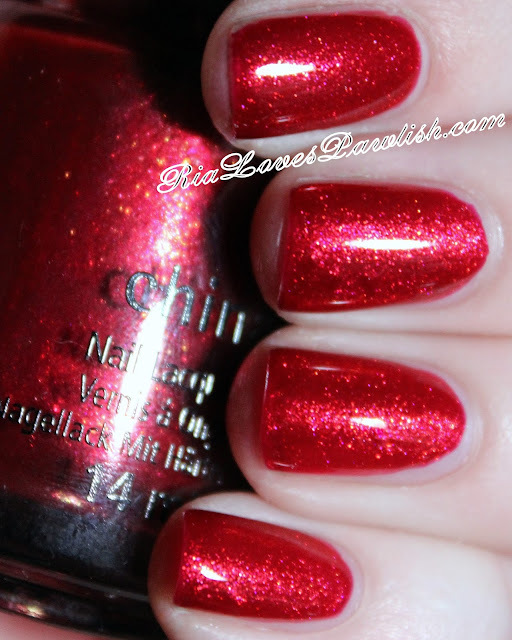 it's a rich, red shimmer... nothing groundbreaking, but a must have color for your collection. if you don't have one yet, Peppermint To Be is great! two easy coats for full opacity and no visible brushstrokes. it's doesn't dry very shiny on its own, so you'll need to help it out with a glossy topcoat... this really brings out the sparklies! two coats Peppermint To Be, one coat Salon Perfect Crystal Clear Top Coat. today was hill day with Echo... which just means we wander around, going up and down hills to keep her nice and muscular. she loves Mondays because they are hill days, and she just has to walk :D nothing much going on this week except for riding... love weeks like this! today's China Glaze Cheers! collection polish is Wine Down For What?. (it's a press sample, kindly provided to me for review). 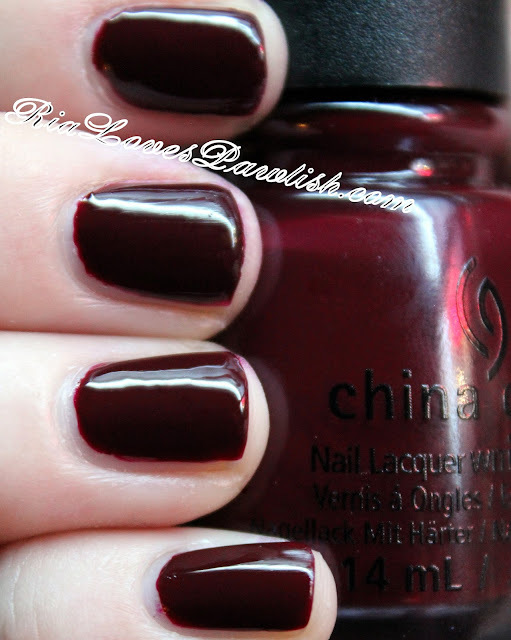 it's a true oxblood creme, lots of warmth with brown undertones within a dark, dark red. it doesn't generally look black unless your in low light... otherwise, it stays pretty much the same. nice and opaque, it's perfect in two easy to apply coats. it dries glossy on its own, but it's even better with topcoat... the topcoat actually brings out a little squish to the creme finish! two coats Wine Down For What?, one coat Salon Perfect Crystal Clear Top Coat. Labels: Cheers!, China Glaze, Creme, Crystal Clear Top Coat, Nail Enamel, Nail Lacquer, nail polish, nail varnish, Oxblood, Press Sample, Red, Ria Loves Pawlish, RiaLovesPawlish, Salon Perfect, Wine Down For What? Mama Pawlish's brother stopped by while he was on his way back home after visiting their mom in Virginia... we met up at a restaurant and had a great lunch :) it was really nice to be able to catch up! afterwards, Mama Pawlish, Mr. Pawlish and me went shopping for our Angel Tree child (it's a charity in the US that finds needy children that won't be given much for Christmas, even things they need like clothes)... i love to be able to help make a child's Christmas a bit more merry <3 i hope she likes what we picked out! we are kicking off China Glaze Cheers! collection today! it's their holiday collection for 2015 :) first up is Better Not Pout! (it's a press sample, kindly provided to me for review). Better Not Pout is a dark fuchsia pink with a pearl finish... it's a bit more burgundy than it looks in the swatch photo. you can see some brushstrokes, but not nearly as much as i would expect from a pearl! still, make sure to keep your strokes even and avoid those wobblers :D it applied really easily and is completely opaque in two coats. it's got a little shine on its own... adding a shiny topcoat really brings it to life! two coats Better Not Pout, one coat Salon Perfect Crystal Clear Top Coat. the past two days have just been totally gross! pouring rain and cold... BUT, at least it wasn't snow :) i had a lesson yesterday, and just exercised in the indoor arena today. i'm really going to miss riding outside, but we're hitting that part of the year in Maryland where riding outdoors just isn't going to happen often. super happy to have the indoor, though... without it some days i wouldn't be able to ride at all! got Orly Frenemy TX to share with you all today... it's a glitter i snagged at TJ Maxx! 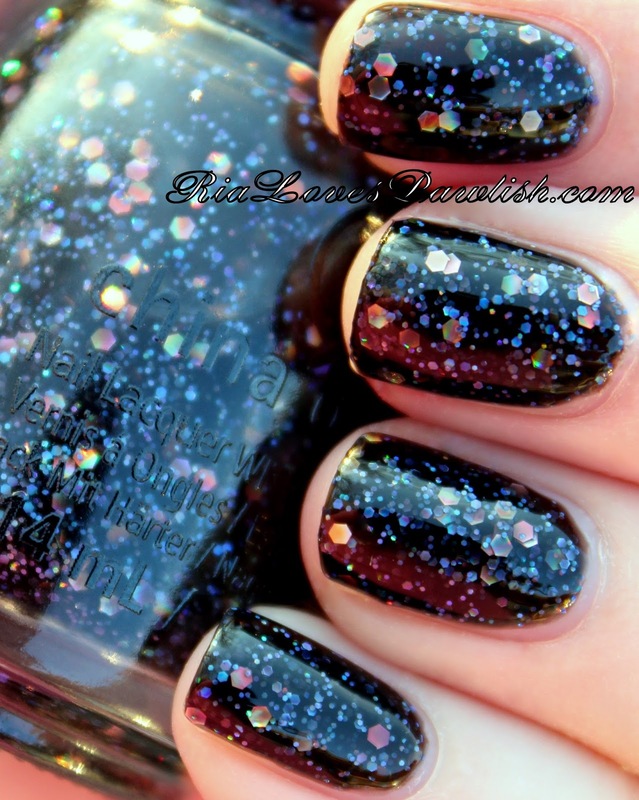 it's made up of loads of holographic microglitter pieces and sparse flakies, set into a sheer black base. you could probably get it opaque on its own, but i like to put two coats over a black creme base... for this mani i used Salon Perfect Oil Slick (press sample). i was pretty bummed that the glitters didn't show up more, and only one or two pieces of flakie are visible. it definitely requires a high shine topcoat to bring out as much sparkle as possible! two coats Frenemy TX over Salon Perfect Oil Slick, finished with one coat Salon Perfect Crystal Clear Top Coat.